I have downloaded the Wordpress application for my Blackberry. Now I can blog straight from my mobile phone (like this post). Isn’t it cool! Now I can share my complaints about long queues with the world before I reach the front of the queue! Awesome! This article is part of my research on My Fathers Before Me. 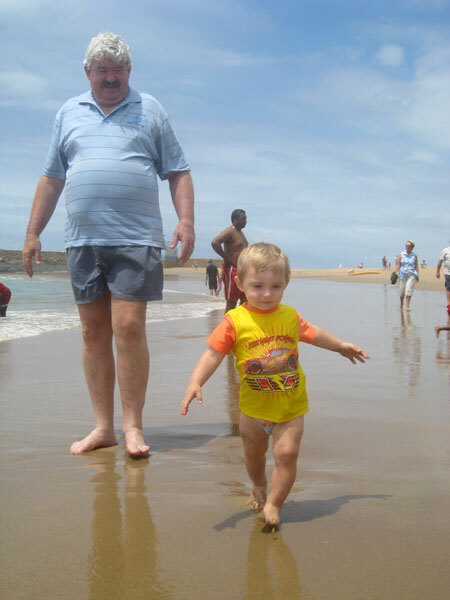 David Senecal was the second generation Senekal in South Africa, in a line of Senekals of which I am the tenth. I will update this article as more information becomes available, so please check back from time to time. Last updated: 25 February 2010. David Sénécal was the eldest son of David Sénécal and Anna Madelaine du Puys. (Read more about David and Anna here). He was born on 3 October 1695 in the district of Klein Drakenstein, in modern-day Paarl. During the early part of his life he must have lived on the farm “Salomons Vallei”, where his parents moved to some time during 1695. 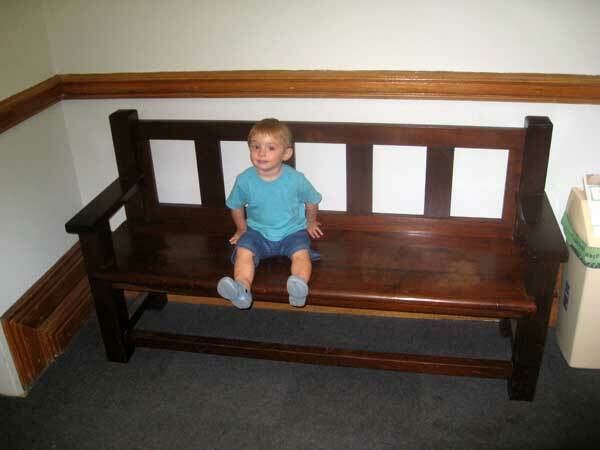 Records show that he was christened on 16 October 1695 in Drakenstein. He was probably christened by Reverent Pierre Simond, who was the reverent for the French Huguenots at the time (I need to confirm this fact). I unfortunately do not have any information about what he did during his lifetime, and would love to dig up stories about him. He married Marthe Marie Bruére on 30 November 1732. The interesting thing is that Marthe was David’s cousin. Cases where cousins married was common during this time period. Marthe was the daughter of Estienne Bruére and Suzanne Du Puys (read more about them here). Suzanne was the younger sister of Anna, David’s mother. They had five children, David (1733 – bef. 1798), Jacob (circa 1735 – 1771), Daniél (1738 – ? ), Anna Elizabeth (1740 – ?) and Anna Magdalena (1744 – circa 1772). He died in 1769. According to a different source, SAG11, he died on 28 March 1773, on the farm “Hooprivier”, in the district of Swellendam. This article is part of my research on My Fathers Before Me. David Senecal was the first generation Senekal in South Africa, in a line of Senekals of which I am the tenth. I will update this article as more information becomes available, so please check back from time to time. Last updated: 18 February 2010. David Sénécal was a French Huguenot who came to South Africa in 1688. He was the only person with the surname Sénécal (modern-day Senekal) to come to South Africa, and can thus rightfully be assumed to be the forefather (“stamvader”) of all Senekals living in South Africa today. David was born in 1667. His place of origin is given as Dieppe, Normandie in France. Not much is known about his life in France, but by 1688 he made his way to Middelburg in the Netherlands. He was a French Huguenot (“Franse Hugenoot”) and fled from persecution in his home country. I don’t want to talk too much about the French Huguenots (rather read the Wikipedia Article or The SA Huguenot Story), but just very briefly, the French Huguenots were members of the Protestant Reformed Church of France (French Protestants or Calvinists). They were opposed to some of the views held by the Roman Catholic Church, something which led to bitter wars and persecution. A large group fled the country and settled in many different parts of the world, including South Africa. The Huguenots that came to South Africa came via the Netherlands. At the time, the Netherlands, under the Dutch East India Company (DEIC) (or the Vereenigde Oost-Indische Compagnie (VOC) as it was known in Dutch), set up a refreshment station at the Cape of Good Hope, to supply ships passing between Europe and India with fresh supplies. The DEIC was looking to grow the colony in the Cape in order to sustain its supply of fresh food, and provided and opportunity for the Huguenots to come to the country. The DEIC would bring the Huguenots to South Africa on board their ships, in exchange for staying in the country for at least 5 years and applying their skills in the colony. The bulk of the Huguenots came to South Africa in the period 1688-1689 (about 20 arrived earlier in the period 1671 – 1688). The ships included (in order of arrival) the Voorschooten, Borssenburg, Oosterland, De Schelde, Berg China, Zuid Beveland, ‘t Wapen van Alkmaar, Zion, Spierdijk, Agatha, Vosmaer, Driebergen, Cattendijk, Westhoven, Donkervliet, Reijgersdaal and Helmeet. The journeys by sea took about 4 to 6 months. It was extremely treacherous conditions, not only due to the pitfalls of the sea, but also due to the lack of fresh fruit and vegetables, causing scurvy. Some also fell victim to pirates or were attacked by French ships. Many lost their lives at sea. And so the story really begins with David boarding the Zuid Beveland on 22 April 1688 in Middelburg, Netherlands. The ship was 130 feet long and carried 175 passengers of which 25 were Huguenots. The journey took 4 months and they arrived at Table Bay on 19 August 1688. Disaster struck when a small boat that brought some of the passengers to land was capsized by a strong wind, killing many of those it was carrying. Of the 25 French Refugees that boarded the ship, only 13 made it to the Cape alive. Their names are Salomon De Gournay, Charles Le Long, David Sénécal, Abraham Vivier, Pierre Vivier, Jacques Vivier, Louis de Bérault, Estienne Viret, Daniel des Ruelles, Esther de Ruelles, Anne de Ruelles, Rev. Pierre Simond and Anne de Bérault (the names of those who passed away on their journey is unfortunately unknown) There was some excitement about the arrival of Reverent Pierre Simond and his wife Anne de Bérault, he was the first French reverent to arrive in the Cape, and being very religious, the French Huguenots must have been looking forward to his arrival. What fascinates me about the story, is what it must have felt like for the young David to come to South Africa. He was perhaps 20 or 21 at the time, and must have left all his living family (were his parents and siblings killed in France perhaps?) and most earthly possessions behind to come to an unknown country. He must have known about the dangers of coming to South Africa by ship and must have been uncertain about what awaits him in the foreign country, from where he probably will never return to his home country. What was the journey by sea like, and were some of his relatives perhaps those that drowned in the small boat that capsized? Was he perhaps in the small boat and had to swim to the safely of the shore? Was he great friends with some of the others on the ship? How was he going to sustain himself? Suzanne Du Puys married Estienne Bruére on 19 February 1702. 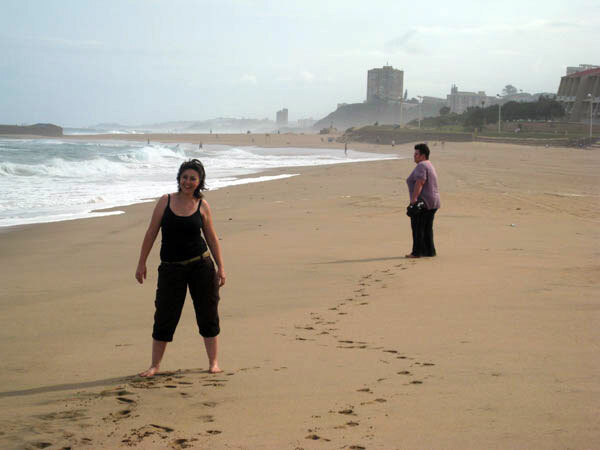 The Du Puys surname no long exist in South Africa, but the two Du Puys sisters were the progenitors of the Senekal (Anna) and Bruwer (Suzanne) families currently living in South Africa. And so the 27-year-old David found himself a 23-year-old wife. A year later, on 3 October 1695, their first child was born, named David after his father. David and Anna had 12 children – 8 boys and 4 daughters. They were David (3 Oct 1695 – 1769 or 28 Mar 1773), Salomon (1697 – ? ), Jean (1699 – 13 Dec 1768), Anna Magdalena (1701 – Jan 1790), Susanna (1707 – 1738), Samuel (1709 – ? ), Elisabeth (1712 – May 1781), Izaac (1714 – ? ), Daniël (Mar 1716 – ? ), Magdalena (or Madeleine) (1718 – 29 Oct 1804), Petrus (1721 – 10 Apr 1760) and Jessaia (1724 – ?). 5 of the boys died at a young age and two of the boys died without ever marrying. The oldest son, David, was the only one who had children and carried the Senekal name forward. In total, David and Anna had 26 grandchildren, which was apparently quite a small number for people of that era. David and Anna lived on the farm “De Hartenbeests Kraal” in Klein Drakenstein (when exactly they started living there is uncertain, it could be in 1694, although it seems that the farm was awarded to David in 1692). In 1695 they moved to the farm “Salomons Vallei” in the Paarl (this farm was neighbouring De Hartenbeest Kraal). (This farm was awarded to Salomon de Gournay (the husband of Anna’s mother) in 1692 and it seems that David and Salomon swapped farms in 1695). My personal theory is that David knew Salomon well (having both come to South Africa on the Zuid Beveland). They were awarded farms next to each other. Salomon married Anne in 1693 and Anne’s daughters Anna and Suzanna came to South Africa in 1693 as well, probably living with Salomon and Anne. I believe it very likely that Anna was thus “the neighbour’s daughter” and that David started courting her, eventually leading to their marriage in 1694. David died on 16 July 1746 at the age of 79. I recently became interested in genealogy. I guess having been on the planet for 30 years, one start to think about your place in it and what your legacy will be. And your only true legacy is through your children, and I am honoured to have a beautiful young boy, little Erik, who will carry my legacy forward. But one also have to take a step backward and think about those who came before you. I am blessed to have had a great father, who taught me many great principles – he always showed compassion for others, treated people with respect and dignity, freely gave his trust and money to those in need. He was an extremely hard worker, with an eye for detail, motivated and responsible. He was a calm observer, someone who didn’t just babble along with others, but would rather listen and carefully observe. He always upheld very high standards and I am grateful that he made me the man that I am today. My father passed away just a few months before little Erik was born. In a sad twist of history, my grandfather also passed away just before I was born. And in my genealogical research, I found that this has happened a couple of times in my Senekal family tree. But it had me thinking – I didn’t know much about my grandfather – and I am sure he was a great person too. So in due course, I will tell my little boy about his grandfather and the beautiful example he set. Although having a grandfather can never be replaced, I hope capturing some of the stories about my father and telling them to Erik can give him some sense of the great man that he was. In the same vein I would like to capture some stories about all the fathers before me, and I will tell their stories in the months and years to come. I am no. 10 on the list, and Erik is no. 11. Click on the image below to enlarge. I found a great amount of detail on the Senekal Family website. In fact all the detail from no. 1 to no. 7 in the list came from the website. The research was done my Adélle Jerling (previously Senekal) and she did an absolutely spendid job, having traced thousands of decendents of David Senecal, the first Senekal in South Africa (“die stamvader”). David Sénécal (no. 1 on the list) was born in 1667 in Dieppe, Normandie, France. He came to South Africa in 1688 as part of the French Huguenots (Franse Hugenote), on a ship called the Zuid-Beveland. Read more about the Huguenot Story. He was the only person by the surname Sénécal to come to South Africa, and the forefather of just about all Senekals in the country. It is interesting to note that by the third generation, the original “Sénécal” spelling gave way to become “Senekal”, obviously a Dutch influence, which is the spelling as is used today. Another interesting person (no. 5 on the list) is Commandant General Frederik Petrus Senekal. He is quite a famous person in South African history, and led many Vrystaters during various wars. The town Senekal in the Free State was named after him in 1877. I would dearly love to visit this place one day, especially since it is in honour of one of my direct forefathers, carrying the same name as me. Read more about Commandant General Frederik Petrus Senekal. Somewhere in the eight generation, the spelling of “Frederik” also changed to “Frederick”. 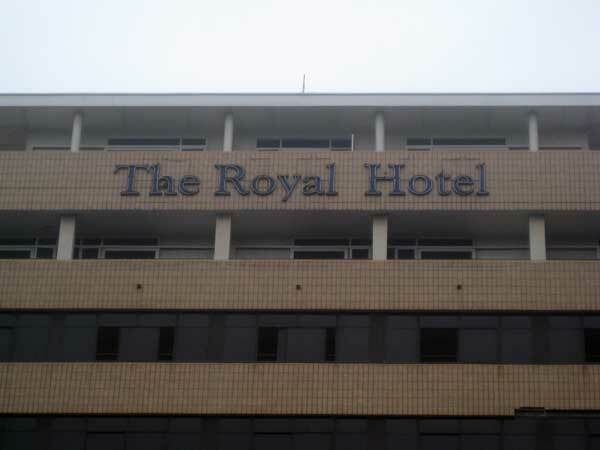 Why was this the case, or was it perhaps just a spelling mistake? Who was the original Frederik after whom the fourth generation person was named after? Where did these people live and what was their day-to-day life like? There are so many interesting questions, and I am on a mission to find out. I wrote this article as an interest piece as part of my responsibilities as a senior researcher in the Mobile Intelligent Autonomous Systems (MIAS) research group at the CSIR. The article will be published by the CSIR at a later date. It can be assumed that the CSIR is the copyright holder of this article. The article is currently in draft form, I duplicate it here to receive feedback on the content of the article. Can machines think? It fills the hearts and minds of small children with dreams of an exciting future, where robotic pets and intelligent servants will fulfil their every fantasy. It perplexes scientists and engineers who wish to discover the secrets and inner workings of intelligence. It makes for great science fiction and spectacular, block-buster Hollywood movies. Can machines think? It is a thought that terrifies the general public, filled with visions of a future where mankind will be enslaved by their more intelligent, silicon-based creations. It leaves lawmakers puzzled as to the legal implications of living side-by-side with intelligent machines, what rights they should have and what responsibility they should assume. It challenges our beliefs about our own uniqueness, our inherit sense of being special, our souls. Can machines think? It probably is a question that has been around almost as long as thinking Homo Sapiens itself. We live in a time where great technological advances seem to be occurring quite regularly and at a greater pace than ever before. In the last hundred years, we went from horses and wagons to supercars and massive freight ships, from letters and postal routes to the Internet, e-mail, mobile phones and complex communication networks, from pinhole cameras to digital camcorders, high-definition televisions and video-on-demand, from dreaming of going to space to having landed on the moon to having robotic machines roving on Mars and feeding us valuable scientific data. The technological state of the world a hundred years from now seems almost unimaginable. Most futurists envision a world in which we will live side-by-side with machines as intelligent or more intelligent as ourselves, machines that we created. But is this even possible? What does it mean to think and can we develop technology to do so? How will these machines be able to cope with the difficulties of understanding complex human environments? Many people view a game such as chess as a good measure of intelligence (at least in a limited domain), requiring careful planning and reasoning, pattern recognition and experience with a wide variety of positions and tactics. A machine that is good at chess can certainly be called intelligent, right? To measure chess ability, the ELO rating system is widely adopted. In this rating system, an entry level player may have a rating of 1200, a strong player could have a rating of about 2000 and a grandmaster would have a rating of about 2500 or more. The very best players would attain a rating of about 2800. In the peak of his career, former world champion Gary Kasparov achieved a rating of 2851. The current world champion, Visvanathan Anand, has a rating of 2790 (as at 1 January 2010). In comparison, the best chess playing software, currently considered to be a program with the name Rybka, has an estimated rating of about 3200. That would give even the world champion only about a 5% chance of beating the program. In the few cases where Rybka played against grandmaster chess players, the results were indeed mostly favourable for the machine. How does Rybka work? Internally, it uses a well-studied algorithm in computer science known as alpha-beta search. When playing chess, a player needs to make the best move given the current position. The best move is the one that will put the player in a better future position, ultimately leading to a checkmate. The problem is that the number of future positions that need to be evaluated quickly grow very large. For example, at the very beginning of the game, white can choose among twenty different moves, to which black can reply with twenty different moves. Thus, after a single move from both players, there could be any one of 400 different possible positions on the board. On average, a player can make about 35 different moves in most positions. Thus, looking only three moves ahead for both white and black would require nearly two billion positions to be evaluated. The alpha-beta algorithm is a technique for eliminating moves that are deemed to be inferior from the evaluation, much like how humans go about when playing chess. Rybka uses this alpha-beta algorithm with aggressive pruning, to “look far ahead” in the game. This ability, together with a finely-tuned heuristic for evaluating a position, allows it to play at superhuman strength. Rybka (and the more primitive calculator for that matter) does illustrate two good points though. Firstly, it is possible to create machines that exhibit intelligent behaviour in a limited domain. And secondly, that sometimes the mechanisms giving rise to the intelligent behaviour can be precisely described. One might argue that chess is a well-understood game, with defined rules that make it possible to develop algorithms that excel at playing chess. Rightly so, and the leap to create machines that can interact in a human environment – an environment which is only partially observable, stochastic and dynamically changing – seems quite hard indeed. Is it possible to create machines or robots that can behave intelligently in a real human environment? Robots are often found in manufacturing environments working on an assembly line. These robots have a limited number of conditions for which they need to be programmed, reducing the complexity of the problem and making it possible to perform their tasks efficiently. The way in which scientists and engineers are making progress, is by incorporating similar principles in robots designed to operate in human environments. Perhaps one of the best such examples is the recent development of autonomous vehicles, also known as driverless cars. The idea is to create vehicles capable of driving by themselves under normal traffic conditions, offering a taxi-like experience, but without a human driver. Recently, a series of Grand Challenges organised by the Defense Advanced Research Projects Agency (DARPA) in the United States brought autonomous vehicles to public attention. In the first two challenges, the vehicles had to drive autonomously under off-road conditions on a course in the Mojave Desert, using only onboard sensors and systems. In the second of the two challenges, five vehicles completed the challenges successfully. The winner, a vehicle named Stanley from Stanford University, completed the 212 km course in just less than 7 hours. 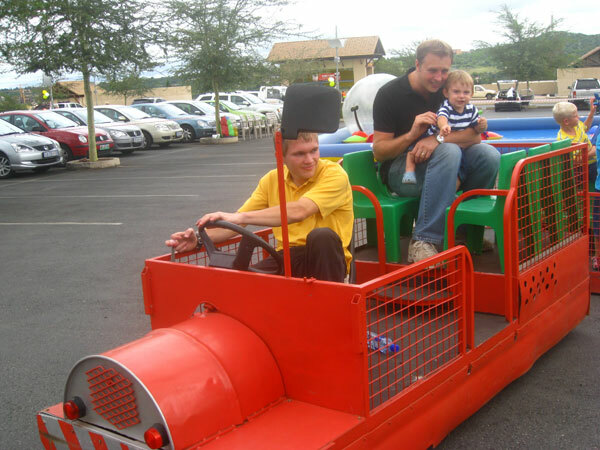 In the 2007 Urban Challenge, vehicles had to drive in an urban area, obeying all traffic regulations while negotiating with other traffic and obstacles and merging into traffic. Six teams successfully completed the course, with a vehicle named Boss from the Carnegie Mellon University finishing first. DARPA’s aim with the competition is to achieve autonomy in a third of their military vehicles by 2015. But even in earlier years, there was much interest in autonomous vehicles. As early as 1995 an S-Class Mercedez-Benz undertook a 1600 km autonomous trip, achieving speeds of up to 175 km/h on the German Autobahn, even overtaking other vehicles. The vehicles achieved 95% autonomous driving, even driving up to 158 km without human intervention. With such successes, many car manufacturers are investing heavily in technology to make autonomous driving possible. General Motors is rumoured to begin testing autonomous vehicles by 2015 and possible having such vehicles on the road by 2018. As is the case with the intelligent chess-playing Rybka, autonomous vehicles such as Stanley or Boss achieve their perceived intelligence through a good understanding of their problem domain. These vehicles are fitted with an array of sensors aimed at giving it an appreciation of their environment, route and path planning systems that enable them to make the best decisions as to how to reach their driving destinations, complex control and actuation systems to make them traverse safely, etc. As is the case with Rybka, each one of the subsystems is relatively well understood, and the apparent intelligence comes about as an emergent property of putting all these systems together. So it would seem that it is possible to build machines that exhibit intelligent behaviour. 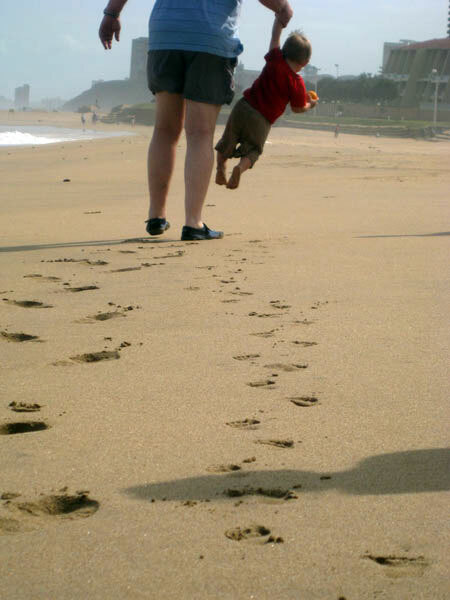 We could even understand the building blocks that are necessary for such intelligent behaviour to occur. But it does seem that we have only achieved success in limited domains. Is it possible to achieve thinking in a deeper sense, in the same way as humans, being able to generalise and excel across multiple problem domains? What does thinking mean anyway? Until now, we have used the terms “thinking”, “intelligence” and “intelligent behaviour” in a somewhat interchangeable manner. Scientists in artificial intelligence distinguish somewhat between machines that think intelligently and machines that act intelligently. A calculator might be good at thinking without making any errors, but do not act much in the world apart from allowing a user to enter values and to display results to the screen. There is also a distinction between thinking or acting in a way humans do and thinking or action rationally. Rationality can be defined as making the optimum choice given the current circumstances to achieve the best possible outcome, something humans might not always be good at. Opinions about exactly what intelligence or thinking means differ vastly among scientists. To illustrate the difficulty, consider the question: “Can machines fly?” It is a question that seems innocent enough and one that most people would answer in the affirmative. Have we not built aeroplanes with truly marvellous characteristics? The Lockheed SR-71 (commonly known as the Blackbird) is a manned airplane that can fly at speeds up to 3500km/h, many times faster than the Peregrine Falcon, the fastest bird which can reach horizontal cruising speeds of up to 105-110 km/h. The massive 277-ton Airbus A380 can transport up to 853 passengers simultaneously in an all-economy configuration. And the Voyager 1 spacecraft has travelled over 16.5 billion kilometres from the sun, having passed the orbit of Pluto a long time ago and currently underway to unknown reaches outside our solar system! But some would argue that none of the airplanes can fly with the elegance and manoeuvrability of even the smallest bird. None can change its direction abruptly or gracefully set down where it chooses. Flying is perhaps not just about the ability to stay in the air, but perhaps also about the way in which it is achieved. Airplanes fly in very much a different way than birds do. They use engines and birds muscle, their wings are fixed while birds can move them about freely, etc. And so it may seem that birds have some kind of inherit property that allow them to truly fly, something that machines will never be able to achieve. By analogy, some view true thinking as perhaps not just about being able to exhibit some kind of intelligent-looking behaviour, but also about the mechanisms required to achieve that intelligence. Some might say that although Rybka exhibits phenomenal chess-playing capability, this ability comes about from a well-studied and very deterministic algorithm, not from a brain that allows it to adapt and learn, and so it is not intelligent at all. To be able to truly think, machines would have to have a brain that can show intelligence across many facets of the human experience, which can learn from experience, can generalise across multiple problem domains, can show creativity and emotion and can interact effortlessly with its environment. Some might even say that to truly be thinking, to have a consciousness, requires a “soul”, something that machines would never have. But bequeathing such properties upon a human could be dangerous, for a future might await where we may be disillusioned by just exactly how “machine-like” we are. Humans inherently feel or want to feel that they are somehow special. For centuries, man has viewed the earth as the centre of the universe. Only in the 16th century did scientists like Copernicus, Kepler and Galilei start to suggest a heliocentric view, something that was widely opposed by the authorities at the time, but now seems quite obvious and intuitive to most people. Historically, man has viewed himself as some kind of special creature on this planet. Today, we understand that we are but parts of a larger organisation of different species and that many evolutionary principles have brought us to where we are. Perhaps similarly, out of our need to feel special, man bestows upon himself the right to be the only entity that can truly be intelligent. If we were to truly create a thinking machine, such a machine would challenge our sense of uniqueness, our need to feel special. But there is no scientific evidence to suggest that we cannot create a truly thinking machine. At a biological level, all of our higher-level thinking processes occur in the central nervous system, and predominantly in the human brain. The human brain is an extremely complex organ, and little is understood about large regions of it even in our modern age. Scientists know that structures known as neurons are responsible for computation, memory and the transmission of signals between different parts of our brains, giving rise to our higher-level thinking processes. These neurons are also able to adapt over time, making it possible for us to learn from experience, to adapt to changing circumstances and to generalise over different problem domains. Although complex and often weakly understood biological processes are at work, fundamentally, all intelligence in humans can be explained as the emergent behaviour brought about by the interplay of complex electrochemical processes in our brains. Human intelligence stems from nothing more than biological computation. Fundamentally then, it seems that there is nothing preventing us from studying the human brain, and applying some of the same principles at work in machines, with the expectation of achieving similar results. In artificial intelligence, a widely-used technique, known as artificial neural networks (ANNs), is an example where (albeit extremely crude, simplified and much smaller) models based on the human brain are created to solve complex pattern recognition problems. ANNs have the ability to “learn” patterns over time, and to predict outcomes for patterns it has never seen before. Even though it is very crude and a heavily abstracted model of how the brain works, it is good enough to be used in many real world systems. It is implemented in various systems, from predicting future values in the stock exchange, to fraud detection in credit card usage, to military systems to detect hostile aircraft and missiles. If we knew perfectly how the brain worked, and could translate that knowledge into hardware and software, it would seem then that, at least in principle, there is nothing stopping us from creating machines at least as intelligent as ourselves. Thus, in the same way that we could create a chess-playing program that could play chess at superhuman strength by studying the algorithms required in the limited domain of playing chess, we could achieve success in the much more complex human world by studying an already existing “machine” – the human brain – that is already extremely well adapted to our human environment, and as such create intelligences similar to our own. Of course, some would argue that the brain is so complex that we will never be able to understand it. Others theorise that it may use much more complex computation, such as quantum computing which may be impossible to create in an artificial machine. And indeed then, advancement in the creation of thinking machines and artificial intelligence would seem to be somewhat dependent on progress in other fields. This has been the case for many branches of artificial intelligence, making it a very multidisciplinary area of research. For example, one of the recent surges in popularity is in the field of computer vision, perhaps due to the availability of cheap digital cameras and computational power, making the field accessible to a broader audience of researchers. But the field also relies on a good understanding of physics, optics, cognitive vision, machine learning, signal processing, and other fields. Although the brain is quite a complex organ, recent advances in neuroscience and especially neuroimaging have shed new light on the structure and functioning of the brain. Perhaps illustrating the success of these disciplines is the emergence of brain-computer interfaces (BCI) in the last decade. BCI devices are able to create a direct communication pathway between the brain and an external device. A BCI could either be invasive, requiring brain implants, partially-invasive, residing inside the skull but not connected to the grey matter, or even non-invasive, typically requiring the human to where a device connected to their head. Because of the amazing ability of the brain to adapt, the brain can interpret signals from the BCI and treat it like a natural sensor or effector. It has been used successfully to restore damaged vision, hearing and movement. For example, vision has been restored in a number of patients with non-congenital (acquired) blindness, by connecting external cameras to electrodes implanted on the patients’ visual cortex. Such patients report being able to see different shades of light and being able to distinguish different shapes, enabling them to interact with their natural environment. Although such research is only in its infancy, it promises to bring new hope to many people with disabilities and to become more mainstream and widely accepted. In the author’s opinion, it seems reasonable to suggest that we will make many more discoveries about the human brain in the decades to come and that we will reach a point where, although we may not have a perfect understanding, will be able to conceptualise its functioning to such a degree that we can implement similar functionality in machines. If it is then possible that one day machines could be thinking in the truest sense of the word, what would the implications be for the human race? Should machines be allowed to think? Futures in which intelligent thinking machines have evolved often make for great science fiction. Movies such as The Matrix, I Robot or Terminator frequently take a somewhat dystopian outlook (perhaps because it makes for better stories), depicting futures where the human race are enslaved by robots. Prominent futurists theorise that once we build machines of equal or better intelligence than humans, such machines would be able to build even better machines, which will in turn be able to build even more improved machines, etc. This could lead to an “intelligence explosion” where the rate of change in technological advancement would grow exponentially, reaching a “technological singularity” where the rate of change would seem almost infinite. Machines would be far more intelligent than humans, leading to the situations depicted in the movies. Although such scenarios seem quite dramatic, it is quite conceivable that living side-by-side with machines or intelligent software systems would radically alter civilisation and have a number of serious consequences. Many people fear that many current jobs could be done by machines, leading to large-scale job losses and economic decline. But on the other hand, as illustrated by the industrial revolution, automation also provides the opportunity to create new types of (typically higher-paying) jobs. Some people are concerned about losing their privacy rights. Digital surveillance is becoming more prominent with technologies such as object recognition and speech recognition making it possible to identify and track humans much more easily. As an example, the city of London in the United Kingdom has cameras in most public areas making it possible to find a specific person almost anywhere in the city. Others are willing to give up a bit of their privacy in exchange for the other benefits it provides, such as the ability to recognise criminals and alert authorities, or for example being able to detect a vehicle accident and automatically request emergency services. Machines that can think could also result in a lost of accountability. For example, if a medical system makes an incorrect diagnosis of a patient’s illness, which results in the patient being treated with the wrong medicine, to what extent should the physician be accountable, given that accepted practise is for machines to make such diagnosis? Or if a vehicle that drives autonomously were to create an accident, who should assume responsibility for such a happening? The problem is that if a machine is truly intelligent and acting autonomously, then to what extent is its owner of manufacturer responsible for its actions? Which brings to attention another interesting consequence – to what extent should such a machine have any liberal rights? If a machine is truly thinking, should humans be allowed to enslave and/or discriminate against it? As some of the movies would suggest, there is also the possibility that robots could enslave humans, or wipe them completely of the face of the planet. Where perhaps previously the greatest threat is for nuclear of biological weapons to fall into the wrong hands, it could become quite possible for the “wrong hands” to be the technology itself. In the author’s view, there will be a gradual development and adaption of more intelligent technologies and machines in the next century. This gradual development would provide the opportunity for society to adapt to the changes such technology bring and to sort out many of the issues raised above. Such a gradual development would also make a doomsday scenario very unlikely. Furthermore, the author believes that the technological development would bring about many more positives than negatives, just as the printing press, telephones, television, the Internet or motor vehicles provide society more benefits than detriments. We live in exciting times. The world around us has changed considerably over the last century, who knows where we will have advanced to by turn of the current century? One thing is for certain – intelligent technologies, and perhaps even truly thinking machines, will become ever more important and dramatically alter daily living. At the moment, it is possible to create machines that exhibit intelligent behaviour in limited problem domains, such as playing chess or driving autonomously. These problem domains are often well understood, as are the algorithms that are necessary to create the perceived intelligence. Although no universally accepted definitions exist for what is meant by thinking or intelligence, it is generally taken to mean as possessing similar cognitive qualities as humans. Our current best examples of intelligent machines are lacking in many regards, and cannot rightfully be said to be thinking in the way humans do, being able to learn from, adapt to and operate in a general and complex human environment. However; at a fundamental level, human intelligence is nothing more than biological computation, and so in principle there is nothing preventing us from studying our own biology, extracting the principles behind it and implement it in hardware and software to create machines as capable as ourselves. Although at the moment we do not quite understand our own intelligence and the functioning of our brains in great detail, research is constantly shedding light on it, and creating machines in our own cognitive image is a real possibility. If we were to succeed in creating truly thinking machines, it would have great consequences for society. It may bring many benefits and improve the lives of many, but it may also bring about many societal changes that we will need to adapt to. Perhaps one of the biggest perceived threats that thinking machines hold, is that it challenges humankind’s sense of uniqueness, of being somehow special. We may learn in the process that we are not that special and that we are more machine-like than we care to admit. Or, in our struggles to create machines in our own image, we might just learn to appreciate how wonderful and complex we truly are. Whatever the future that awaits us, it sure is going to be exciting! What is your opinion? Can machines think? Will they ever be able to think at the same level as humans do? This article is posted in the Opinions category. Please comment and express your opinion, but be sure to Follow the Rules. Having opinions make you an interesting person. What a bore would you be if you just agreed with what everyone said all the time? But perhaps more importantly, having opinions – even if those opinions sit unfavourably with others – mean that you are a thinking individual, who are willing to express and defend your own thought process. So I am starting a new category on my blog, called “Opinions” (look for it on under the Category tab on the right side of the page). Here I will be sharing my own opinions on various topics, so check back often. BE INTERESTING. You have to express a clear opinion about what is being said. No “cool article” or similar comments – I want to hear what you have to say! BE POLITE. No nasty replies to my or other people’s comments. We are all allowed to have our own opinions about things and to differ in a peaceful way. PS. Is there something you would like to express an opinion about? Please add it to the comment section of the post and lets start a discussion. I had such an awesome weekend. And I have such awesome friends. Most of my most memorable memories after school involve a small group of friends and I was lucky enough to be able to spend some time with them this past weekend. It is great when you can reach a stage in your friendship where you feel completely comfortable with your friends, and where you can truly just be yourself. So to my great companions this weekend (and in the years gone by) – Adele, George, Hilda, Francois, Esthee and Eugene – thank you for being truly awesome friends! 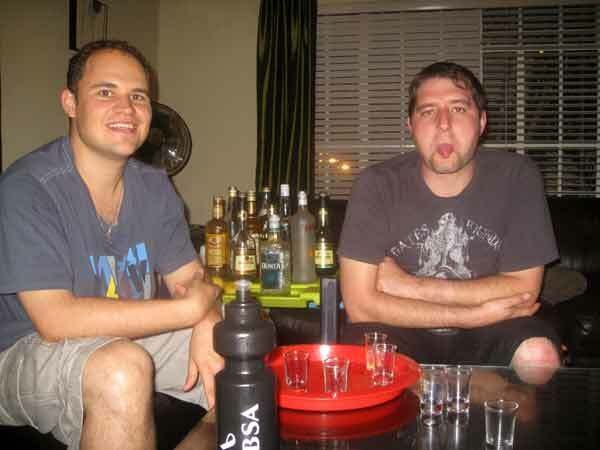 Friday Night – Tuks RAG! So I pitched up at George and Hilda’s place shortly after 6 pm, dropping of my car (Hilda being the designated driver!) and off the three of us went. We pitched up at the Tuks RAG farm, which is mostly like I remember it, except that some of the students look like school children to me! (Yeez, I am getting old! But then again, die bokkies still look damn fine!). Hilda joked with me an George, saying how we were cradle snatchers! The bands were ok-ish, and starred names like Die Heuwels Fantasties and Straatligkinders. We missed Jack Parow, which I would have liked to see, mainly for his somewhat provoking lyrics. (Oh I know, he acts quite zeff, but I am strangely drawn…). There was some rain during some of the acts, and so we danced at one of the discos which is under cover during those times. After a couple of beers, some good bands and some dancing, we decided to go to Hatfield. But not until Die Heuwels Fantasties gave their performance of Lea, which George really wanted to see. And so I found myself repeating the tune of the song later the evening. The ride to Hatfield was quite a scary experience. In Prospect Street, we were waiting to turn right into a parkade, when a white bakkie started hooting at us from the back. The next thing, he overtook us on the left hand side, mostly driving in the parking space (filled with cars) on our left hand side (in South Africa, we drive on the left hand side of the road and so the parked cars would be on that side). He barely missed us, with 5cm to spare. But he accellerated, and drove strainght into a parked car, damaging it very badly (there were bystanders also in the area, he could have easily hurt them very much). The next thing he reversed (and we were scared that he will hit us), and quickly drove away. I had my wits about me, and noticed the licence plate number. We went to park the car, and then returned to where the accident happened, where the University of Pretoria’s campus security have arrived in the mean time. We gave them the details of what happened and I left a note on the car to tell the owner what has happened. Now you can imagine what it must feel like if you get to your car, only to find that it is very badly damaged and has shifted from where you parked it. But the story has a somewhat positive ending. The owner of the car called me on Saturday morning, to thank me for leaving the details of the accident and my number. Armed with the registration number, the police were able to track the bakkie (which is a company car) and it seems that they will take the necessary action with the driver (which probably was drunk at the time of the incident). I still feel bad for the girl (which I assume is a student), since she told me that it is the second time someone drove into her back and her parents are very unhappy with her. Saturday Morning – Barney comes to Town! But by 8 am we had to be up again, since we had quite a bit to do for the day. First we headed off to the Noise Boys in Hatfield, to get the gas of the air con of the car replaced. As usual, I received professional service from the guys there and the air con was cooling again as it is supposed to. By 11 am we were at the Gift Acres mall. We, and especially Erik, were going to meet Barney! 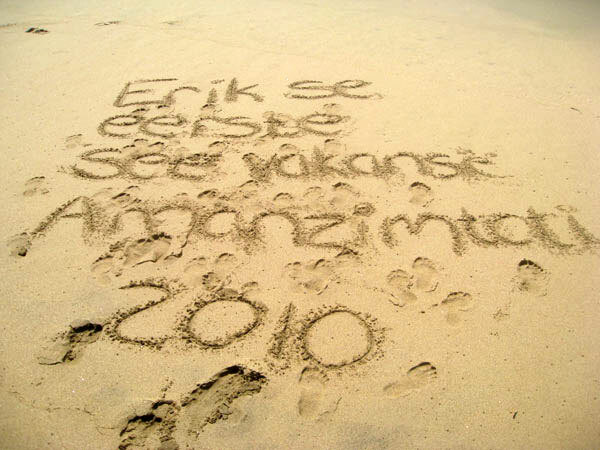 We saw the advertisement some time ago, and were planning to make a special trip for Erik. Erik has been watching the Afrikaans version of Barney on the Kowee channel on DSTV and has absolutely fallen in love with the green and purple dinosaur. And did he enjoy it! 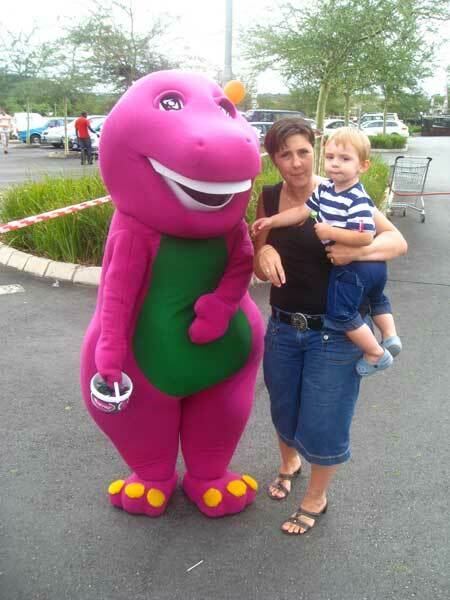 He would take Barney by the hand and walk with him (actually this Barney was a lady, but don’t tell anyone). There were some clowns and a swimming pool for kids, face painters and balloons. Saturday Evening – Braai and Coinage! And so it was Saturday night, and we set out to have a fun filled evening with friends. Eugene, George, Hilda, Francois and Esthee, joined me and Adele (and Erik for a short while) for a braai and to play coinage. Our coinage evenings have thus far been legendary, and make for amazing memories for years to come. This time was no exception. Now coinage is a drinking game – which does involve the sustained consumption of some larger-than-usual amounts of alcohol – and so it is something we don’t do very often, perhaps once every two or three years. But I do have very responsible friends, who know how to have a good time and to make it enjoyable for everyone, without all the unpleasantness typically associated with being drunk. How does coinage work? Well quite easy really – I mean you still have to be able to remember the game’s rules after a couple of shooters. Everyone around the table gets the chance to try and throw a coin in such a way that it bounces of the table and falls into a shooter glass. Should the coin just nick the top of the glass, but not fall into it, the player whose turn it is gets the chance to nominate one of the other players to take a shot. In the case that the coin actually makes it into the glass, the player is allowed to make a rule. And this is really where the fun starts, because if someone breaks a rule, that person needs to take a penalty shot. And the more shooters you drink, obviously the more difficult it becomes to remember all the rules! You are not allowed to say anyone around the table’s names. So you across the table please pass me the shooter glass. You are not allowed to point at anyone. So you across the table, no not you, you! You are not allowed to say yes or no. So in the affirmative as to whether I am having a good time. You are not allowed to accept anything from anyone. So don’t give me the coin or the shooter glass, please put it down in front of me, please. You are not allowed to say “please” or “thank you”. So just put it down in front of me, dammit! If you have to take a shot, you have to swivel the glass twice above your head. But it gets really difficult when you have had 10 shots already. You have to handle the shooter glass with your left hand only. So you have to helicopter the glass above your head using your left hand. You have to say “chorts” after the helicoptor. So you have to do the helicopter with your left hand then say chorts, then down your drink. You have to say “hatisho” before you throw the coin. Oh yeez, should I have said chorts or hatisho now? Sound easy huh? Just try it, it becomes really difficult very soon. And it leads to some very interesting (although completely irrational!) discussions. I mean, where have you ever heard that “bliksem” is a swear word but “dammit” is not!? And so we continued and just had a good time. Even the mighty Francois, who usually is a very composed coinage player, became somewhat tipsy in the end. Poor Hilda sustained more damage, but then again, she has half the body weight of the rest of us. Some time during the night, Karin (Francois’ sister) called to ask whether she has the house to herself… of course that had all of us wondering what she is up to. Eventually, one by one people decided to call it a day and to find a spot somewhere on a couch. In the end, myself, Francois and Eugene ended up just talking and thinking about where life is taking us. Francois is emmigrating to Australia later this year, something which I am truly deeply sad about. But he has good reasons for doing so. After a while he just said something along the lines of “Isn’t there something less depressing we can talk about? So how do you feel about the AIDS crisis in South Africa”. For a comment that was made at 4 am, it was very sharp and had me in stitches! (PS, no offence to people living with HIV/AIDS. Me and my friends discuss the matter from time to time, and realise just how truly gruesome the situation is Southern Africa is, and have great empathy for those who are affected by this pandemic.) But it does somewhat capture the sadness of “losing” a great friend. On Sunday morning we woke up, with some feeling better than others. After a quick coffee, George and Hilda had to leave to complete some tasks for church and Eugene had to leave to complete some work. 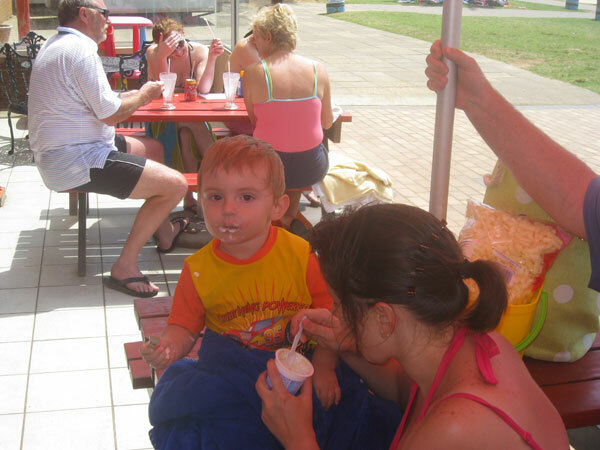 A while later, Francois and Esthee had to leave, because they had a family braai to attend. And so Adele, Erik and me had the day to ourselves. Some time during the day, when changing Erik’s nappy, he decided to run to his potty, and use it for the first time. I felt quite proud that the little guy is growing up so fast. On Sunday evening, Adele, Erik and I watched the musical Mamma Mia. Erik took somewhat of a liking to the music, and the three of us danced and had a good time. It is very rewarding to continually see that honest smile on my boy’s face, and I felt happy and content with life. Thanks to all those who make my life special! 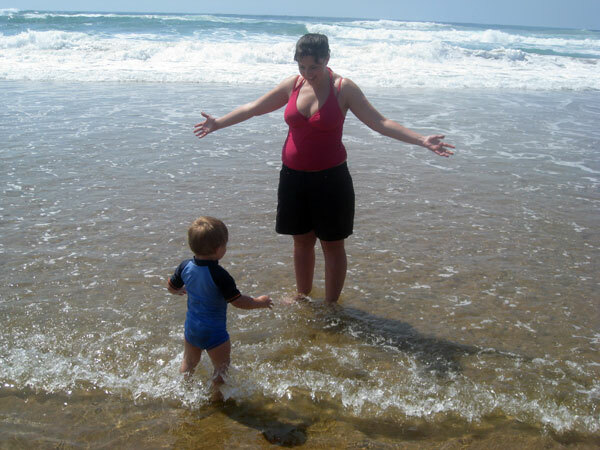 During our short holiday in Amanzimtoti, we drove out to Durban on Saturday 16 January. My mother-in-law, Daleen, wanted to visit some of the flea market stalls. Unfortunately, these were closed and we were looking for something to do. 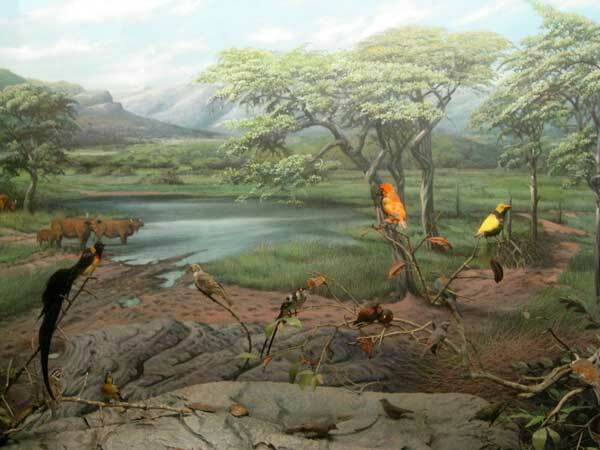 I vaguely recalled visiting the Durban Museum (or more formally the Durban Natural Science Museum) as a child. I also seemed to remember that it was somehow close to the Durban City Hall. 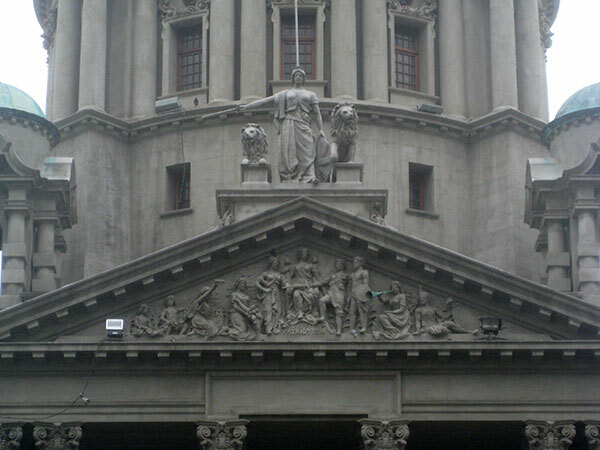 A quick look on the GPS confirmed that there were indeed a museum located by the Durban City Hall. So off we went. 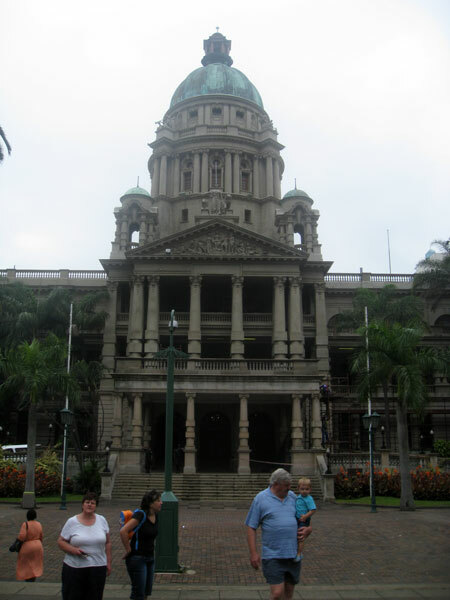 The Durban City Hall is a beautiful old building. I read on the Internet that the building was completed in 1910, and that it is build with Edwardian neo-Baroque architecture. I have no idea what this type of architecture is, but I found it to be really beautiful. The building is decorated with many small sculptures. We didn’t spend a lot of time outside the building, but I am sure that if you took the time, you would see many wonderful small details. At the moment, some parts of the building is being renovated. There are also many beautiful statues in the garden in the front of the building. 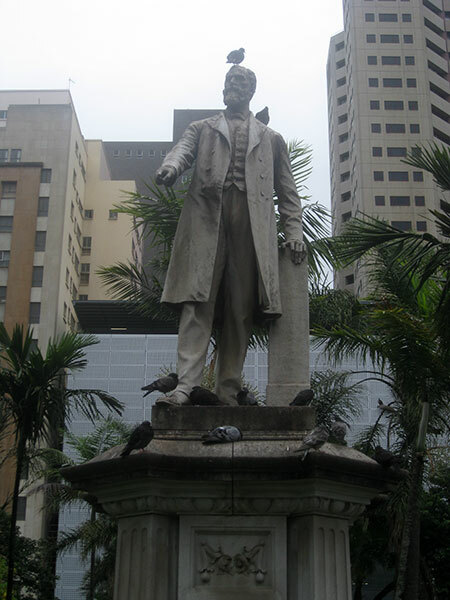 They seem to commemorate the Anglo-Boer war (one of the statues read that the statues commemorate those who died in the period 1899-1902, and from there my inference). The statues seem to be of people with English names, so I presume it in honour of the English side of the war. I seem to recall that there were big statues of animals (as part of the museum display) in the garden as well, but I may be mistaken. Just a little further down the street was this interesting little building. I have no idea what this building is all about, but it looked quite “cute”. I looks quite European in its architecture. 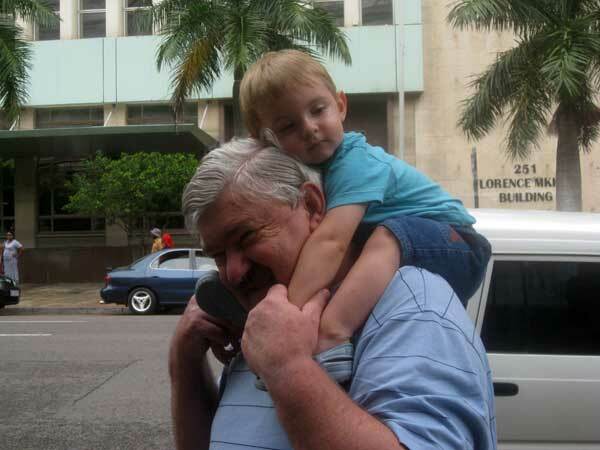 Erik was riding on his Oupa Willie’s shoulders as we were walking. For a moment, it looked like he may fall asleep, but it true Erik style, the tiredness only lasted for about 10 seconds…. And so we entered the Durban City Hall through the side entrance. 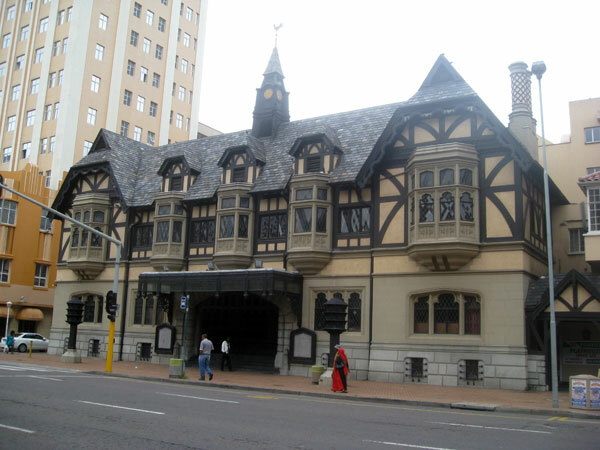 There is a public library on the first floor, the Durban Natural Science Museum on the second floor and the Durban Art Gallery on the third floor. What surprised me greatly was that there were so few people visiting these, especially since entrance is completely free. I guess in today’s age, most people don’t care much for culture. The building’s interior is just beautiful, complete with red carpets on the stairways. The rails are beautifully decorated, the tiles are laid out with interesting patterns, and the roofs have large open and intriguing spaces. They also have a large section on mammals. I find it interesting to see all the trouble they have to go through to set up all the displays. 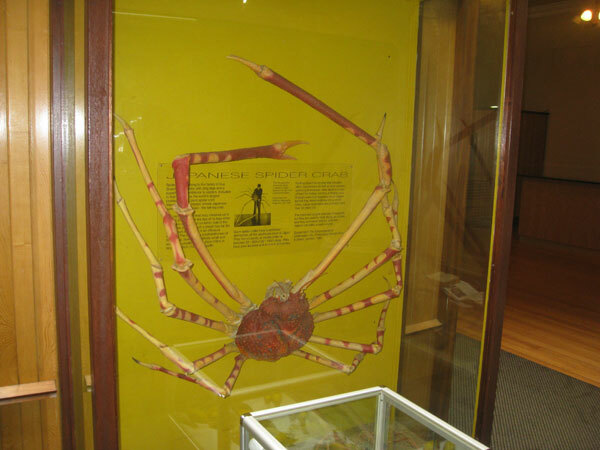 This is a Japanese Spider Crab. When stretched out, this one has a span of 4m from tip to tip of those giant claws. They say that there are ones that grow to have a span of 8m…. this truly scares me! It is like something out of a horror movie. Remind me never to enter any water in Japan…. 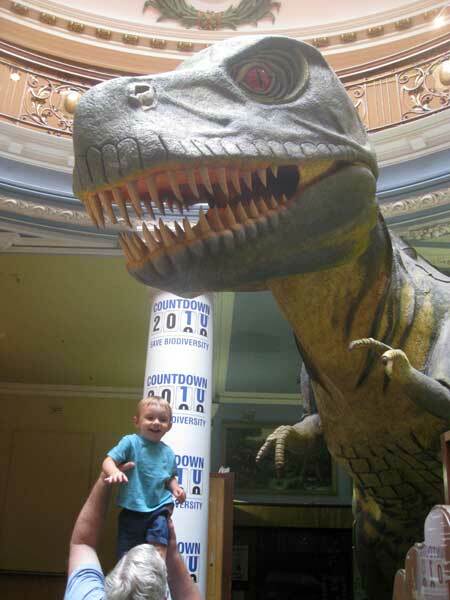 What would a museum be without a giant dinosaur! Just below the dinosaur is this crocodile. We posed Erik on the croc to take a photo. 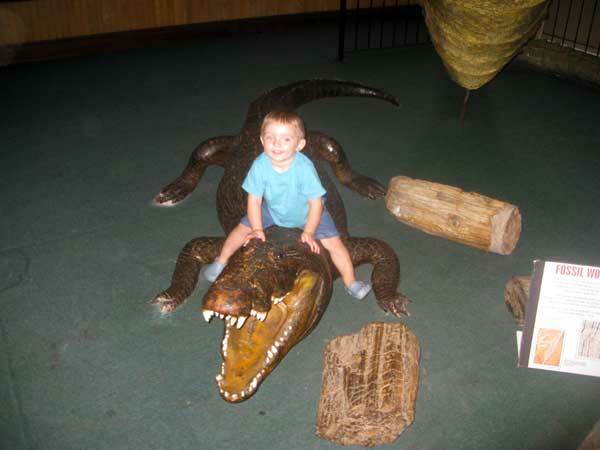 As we moved on the the next display, Erik ran back to the croc and got onto it himself, riding it like you would do a horse! He has really shown the croc who is the boss! After the museum, it was time for a quick break (and a nappy change)! 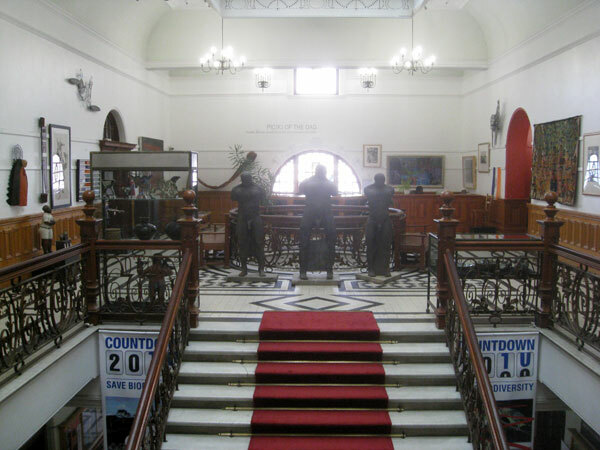 And so we headed to the third floor which houses the Durban Art Gallery. 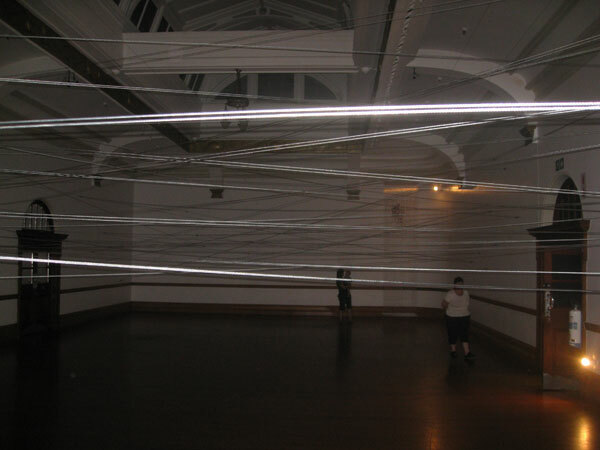 One of the halls is filled with cables, tied from one end of the room to the other end. Although I have no idea what this is for (probably just for the sake of having the cables…), I found it quite expressive in a way. It is refreshing to think that the art gallery are willing to host a hall just filled with cables. Walking through the cabled hall, there is another hall with some art by a black South African, a Mr Hobo, so I guess this can be called “Hobo Art”. 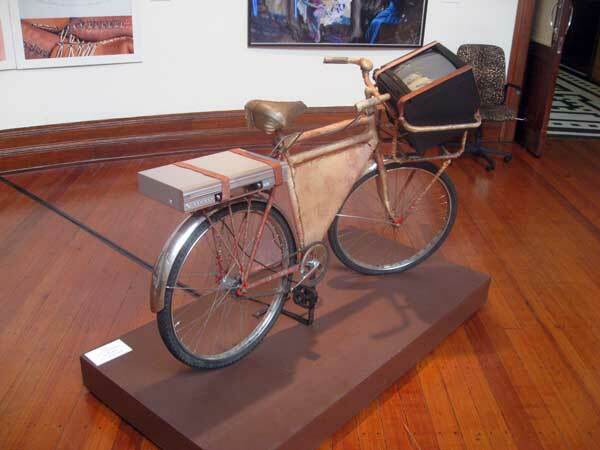 He made eight different sculptures from different materials such as rubber. 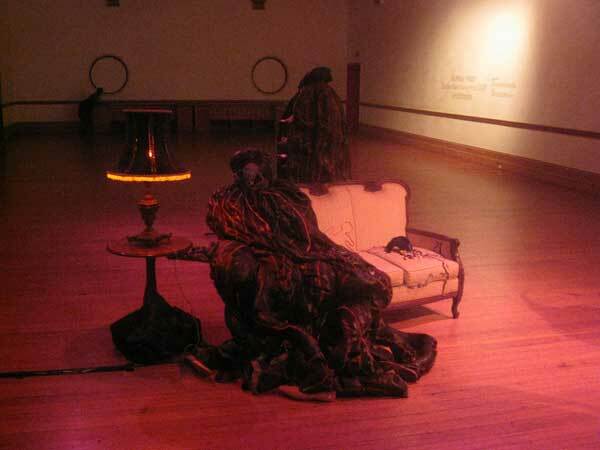 The room is tinted red through a lamp with a red bulb, giving it a very peculiar feeling. The main display room has various pieces of mostly modern art, such as the one pictured below. 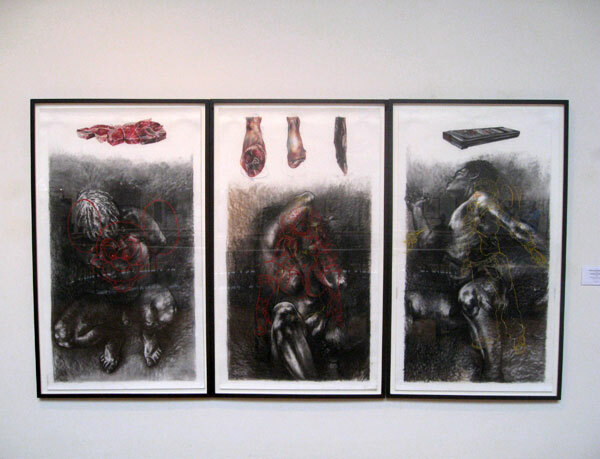 Some of them are very disturbing and provocative, which I find strangely attracting. 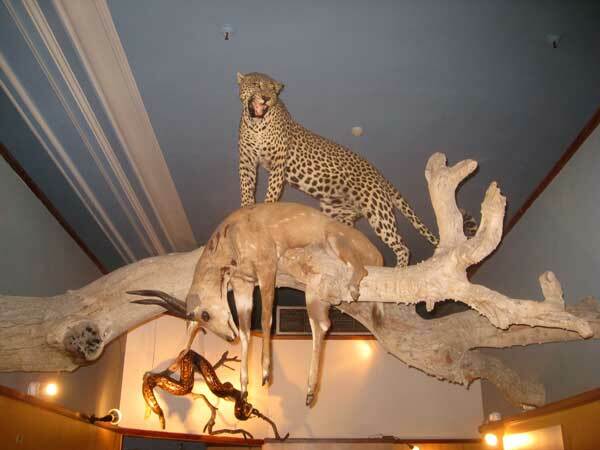 I enjoyed our visit to the museum and art gallery – it was quite interesting. 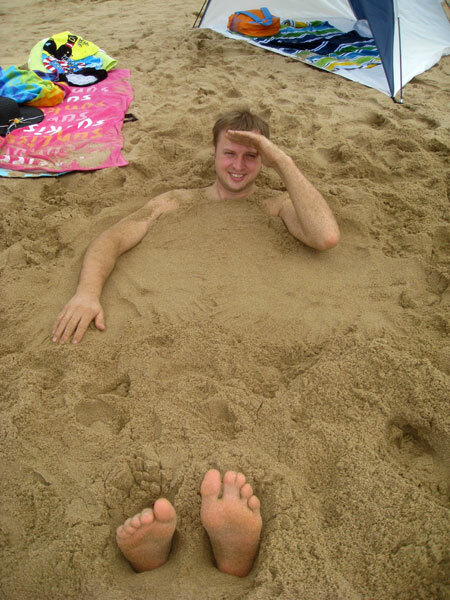 Below is some photos from Erik’s first vacation by the sea. Erik is growing up so fast, and is repeating words that he hears. One has to be careful what you say! So we tried to teach him to say “see” (sea). And he is trying very hard, pronunciating it without the “s”. It sounds something like “kee” when he says it, and it is just lovely to hear him say it. 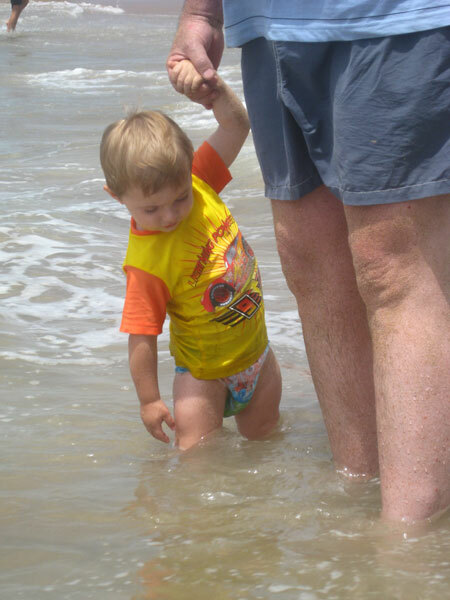 Erik is not scared of the water at all. Even with the waves crashing on him (yes yes, we are only playing in the very shallow water) and getting some of the salt water in his mouth, he just says “nog”, “nog!” (more, more!). He enjoys just sitting in the shallow water and getting his feet buried when the water runs over it. 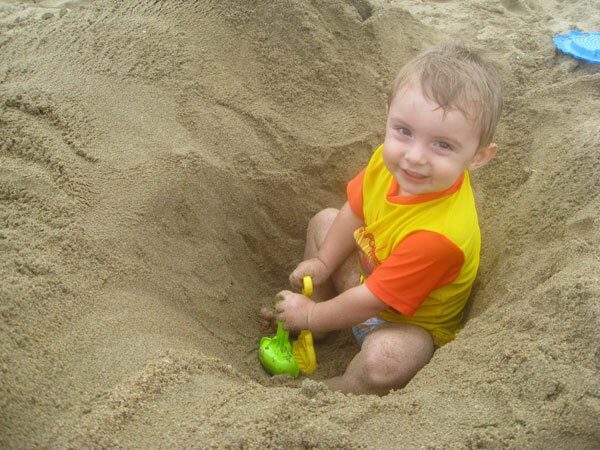 And it is great fun to play in the sand and to help dig holes and build sand castles. If you work so hard digging a hole, surely you should be allowed to sit in it, not so? When it gets cold and the wind starts blowing (which happened on a couple of days), it is time to dress up a bit warmer and sit snugly with mom. 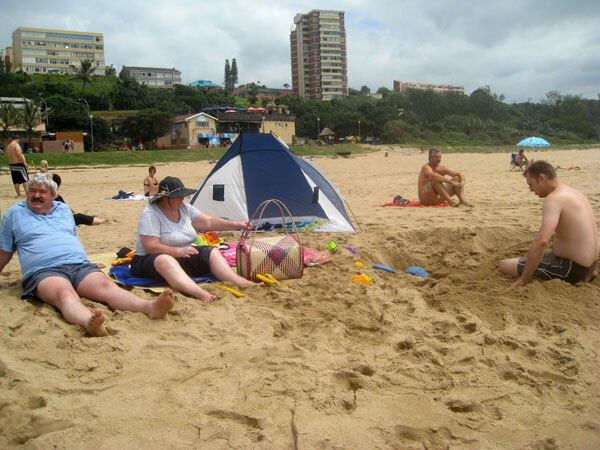 In general there were very few people on the beach (the schools started and most universities also started during our week in Amanzimtoti, so there were only a few holiday makers). And although there were not that many lovely ladies in bikinis , it was still very enjoyable. 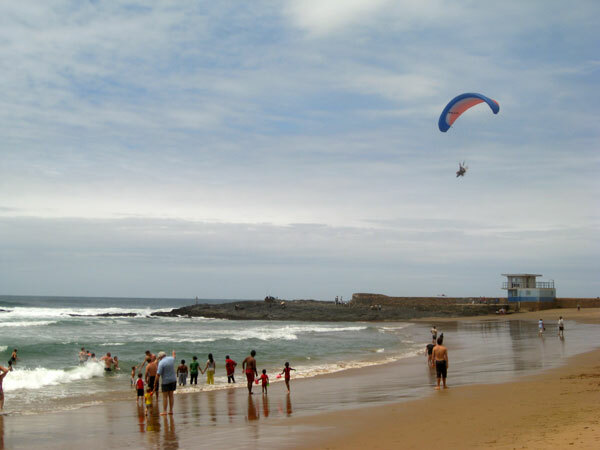 On the Sunday (which was by far also the busiest day), there was even someone flying over the beach, grabbing the attention of many of the beach goers. 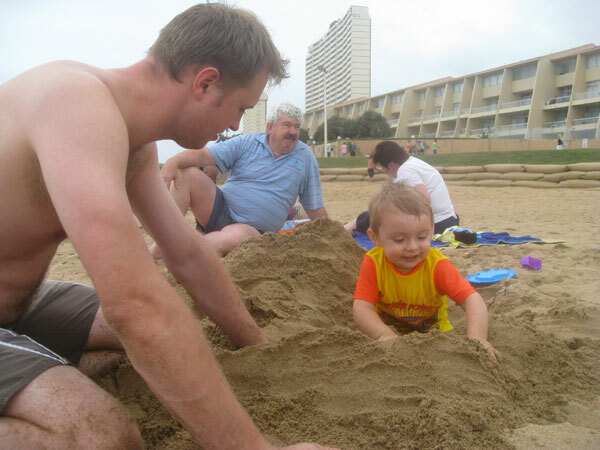 Our short holiday in Amanzimtoti represents Erik’s first time by the sea. These images were taken when we arrived on Friday 15 January 2010, just after we unloaded our baggage from the vehicle. We went for a casual stroll along the main beach (no swimming). 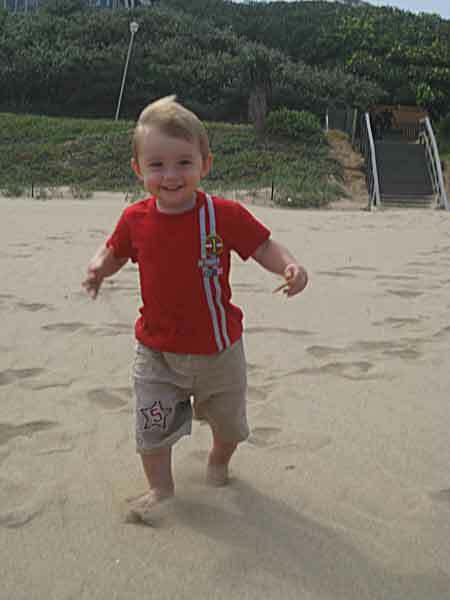 This picture below is just about one of the first pictures of Erik on the beach (we have walked from the stairs in the background). He is just smiles all round. Dis lekker by die see! Erik is swinging on Grandpa Willie’s arm. Adele and Daleen is enjoying it too. 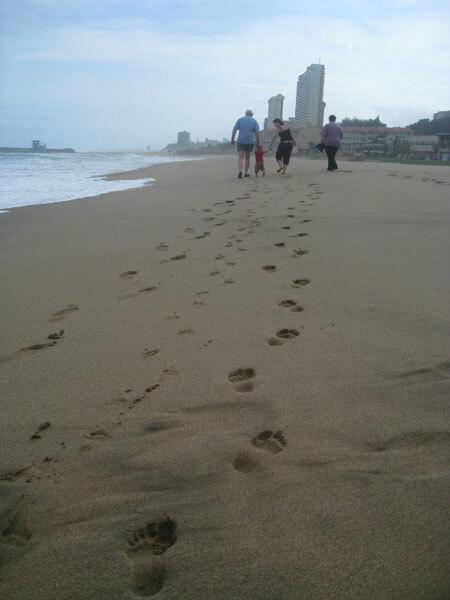 Of course, walking on the beach makes a lot of footsteps, soon to be washed away. 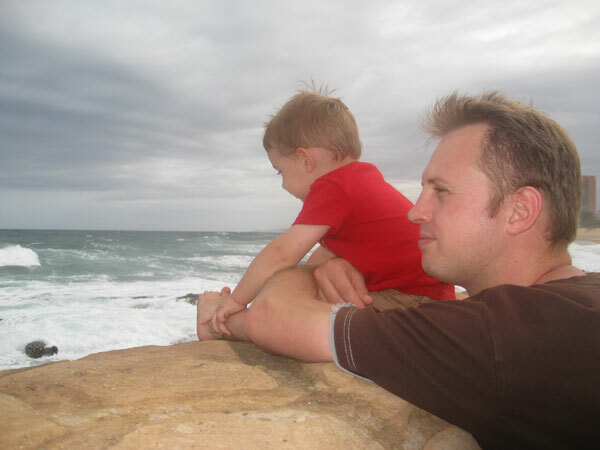 Me and Erik enjoying a moment just staring out across the mighty ocean. Continued on Can Machines Think? WhoPlug – Changing the way the world connects.